If you’re just embarking on a simpler way of life I invite you to take a walk through a typical day in my world. Before I take you for a walk, let me say that life around our homestead is not always sunshine and roses. Money is often tight, animals die, the kitchen floor needs mopping, the dryer might be running on a rainy day, and I may occasionally convince my hubby to pick up supper on his way home from work. Are we perfect? Absolutely not! But, for the most part, we strive to live as simply as we possibly can by relying on God and our own two hands. Come on in…I invite you to follow me along on a typical day in my world. 5:00 AM – This is my favorite time of the day when the house is quiet and I can concentrate on the day ahead. The smell of coffee brewing and breakfast cooking always reminds me of my mother’s kitchen. I enjoy getting my hubby ready for work with a hardy breakfast and his lunch packed for the day. It’s the simple things in life that make me smile. Over the years I have learned to do without so many things, I would consider myself an expert in living a simple life, but lately I have found noise edging its way back in. 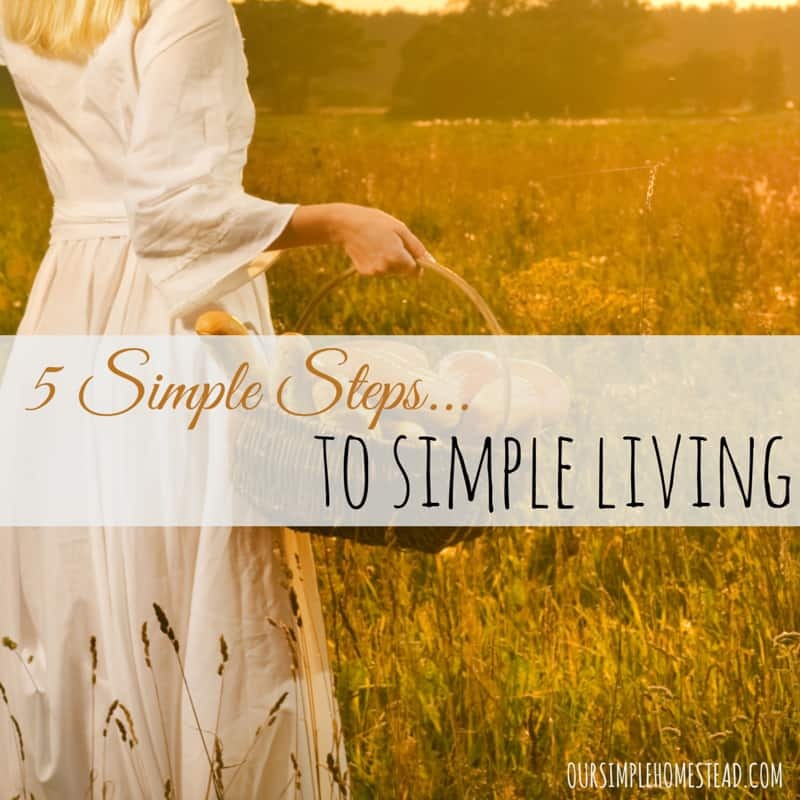 I had to stop and take a good look at my life and I’ve found five things I could do to bring the simple back into my life. 6:30 AM – After breakfast dishes are done and it’s time to make beds and take a quick look around to see what needs my attention. 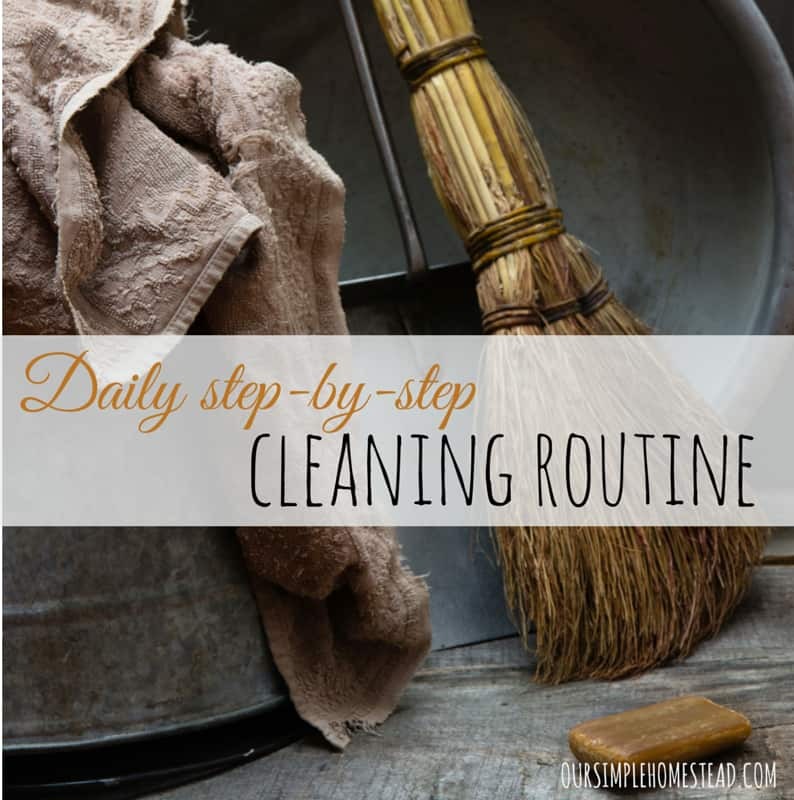 Laundry is usually first on the list, followed by my daily step-by-step cleaning routine. As the clothesline revolution makes a comeback, people are now connecting that household chore to simpler times. I look forward to the few minutes I get to connect with nature and breathe in the smell of freshly laundered clothes while taking in the sounds of the nature around me. I look at line drying as my way of helping the environment while it keeps me connected to a simpler way of life. 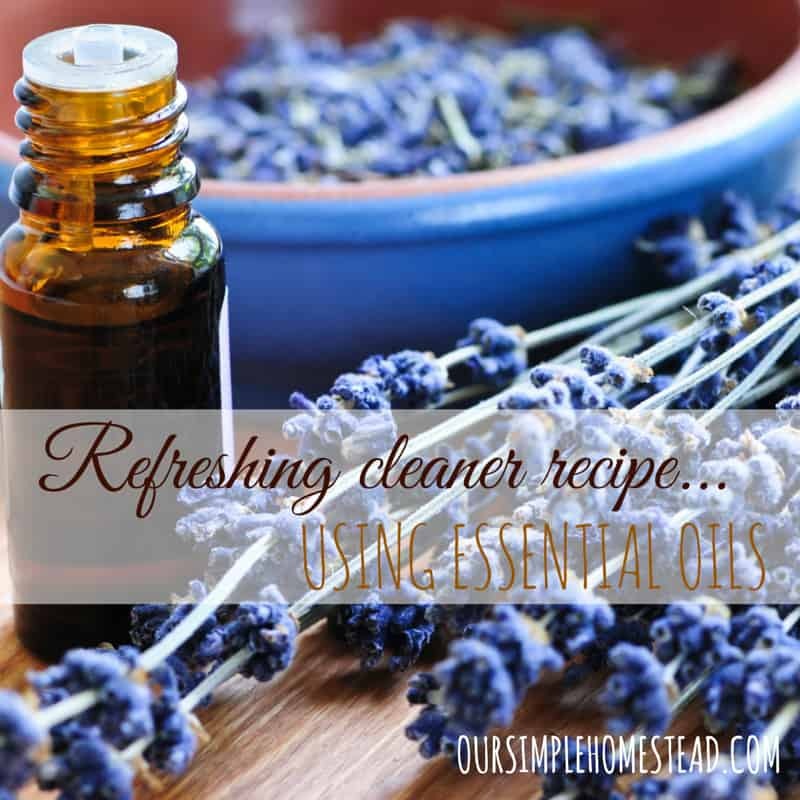 I have used the same cleaning method for years and it has worked for me. My goal of every cleaning day is to start and finish one room before moving onto the next. Today we all have enough options when it comes to cleaning our homes. 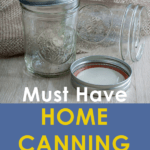 The natural cleaning products are very popular, which is why more and more people prefer to save some money and time by making their own supplies. In case you’ve never tried this before, it is never too late to change that. 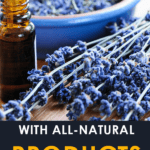 The essential oils play a significant role in many recipes, so now is also the best time to learn more about the individual qualities of each oil. 9:00 AM – By now the chickens are up on the back porch waiting for me to walk them back to the hen house for their breakfast. The cows are mooing to be fed and I can hear the pigs snorting up a storm. Baby chicks are often on my to-do list and need their warm temporary house cleaned. 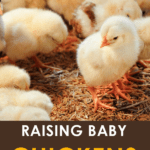 I would consider us seasoned baby chick growers since we have successfully raised over one hundred baby chicks within the last couple years. 10:30 AM – It’s back in the house to get supper in the crockpot. I cut a handful of fresh mint on my way past the garden to brew a batch of my favorite Meadow Tea and I gather eggs from the hen house. Hubby also left a list of bee supplies that need ordered and I look over my seed order one last time. Growing up in Pennsylvania fresh mint grew everywhere. 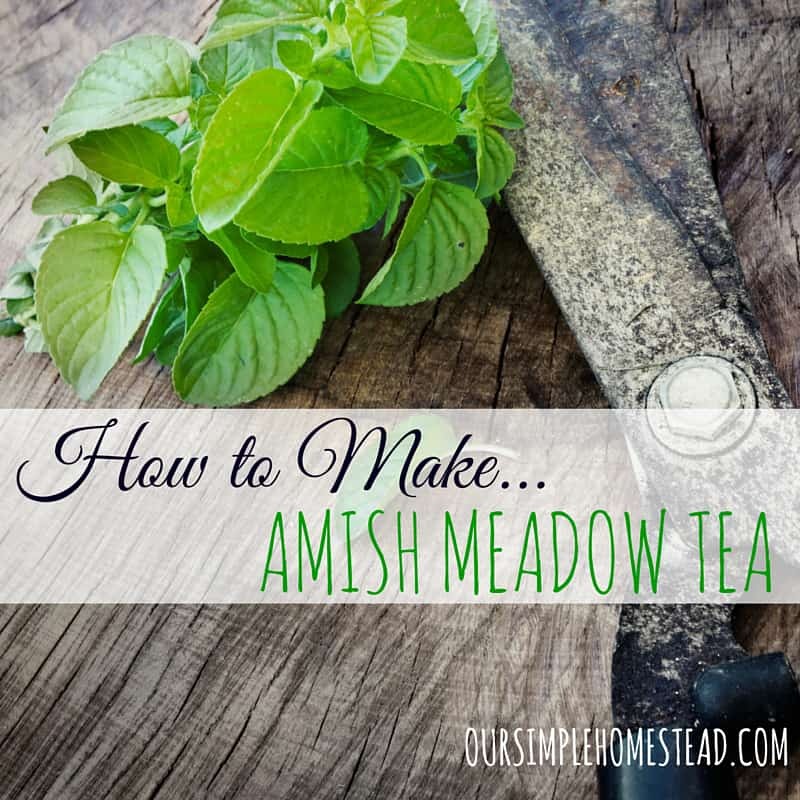 In ditches alongside the road, in gardens, in pots and always in the kitchen gardens of the neighboring Amish women. The smell still has a way of taking me back to the days of riding my bike on our dirt road while jumping off and standing on the side as a buggy or car went by. There aren’t many projects on our homestead that bring us as much satisfaction as our bee hives do. For a small start-up investment in beekeeping supplies and the initial hives, this addition to our farm has really paid off. We have two hives and on average we collect about four to six gallons of honey each year. It is getting that time of the year! Spring is just a few weeks away and I am already planning to keep my plants happy by allowing them to buddy up to their favorite friends! 11:00 AM – It is Chicken and Dumplings and Apple Crumb Pie for supper. 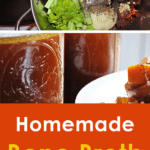 With the weather turning colder, it is time to break out some of my all-time favorite old fashion recipes! I love finding and creating recipes that take only those ingredients that would have been available 100 years ago. 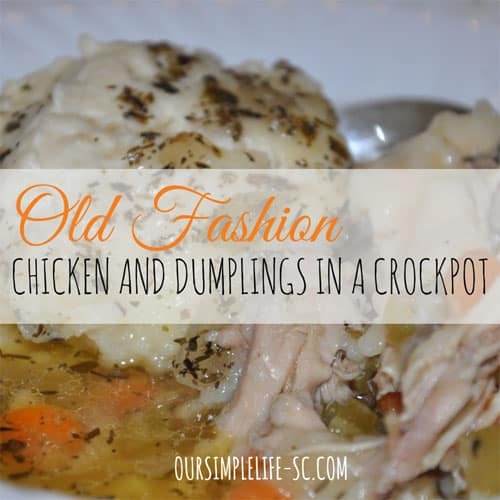 This old fashion chicken and dumplings in a crockpot is a perfect old fashion recipe! 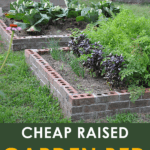 Its ingredients are ones that any homemaker could make by visiting her farmyard, herb and vegetable garden. 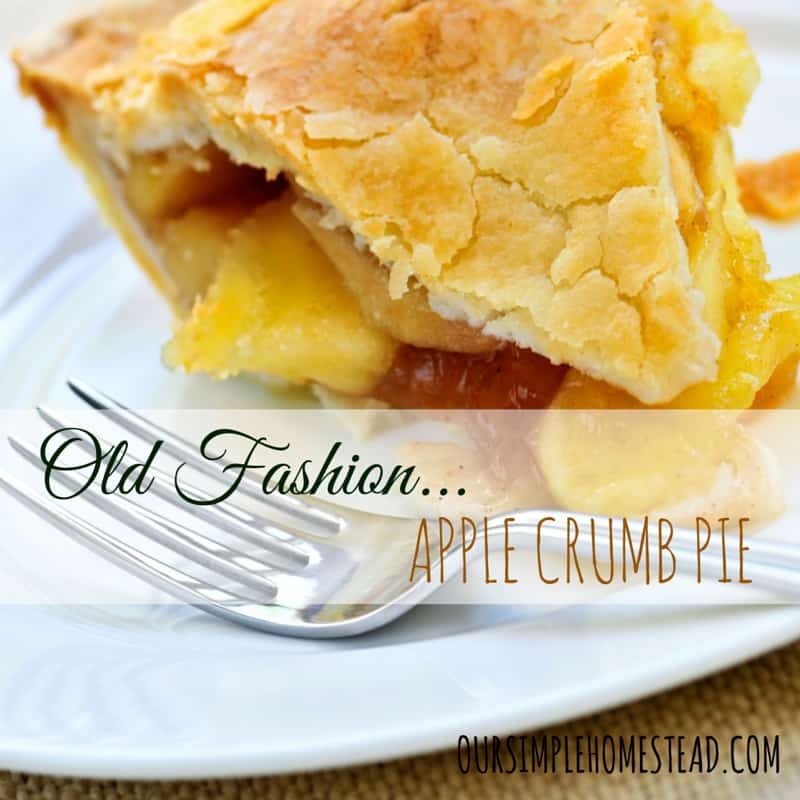 I have been searching for years for an old fashion apple crumb pie that tasted like what I remember my Grandmother making, and I have finally found one! 12:00 – As I eat lunch I look through a crocheting book for a simple pattern to start teaching my granddaughter to crochet. She is fascinated by my needles, so it’s time she starts getting some lessons. Children are our future and the homesteading skills they learn from you will help them face the future as we see it. 12:30 PM – It’s off to my office to get some work done. Even though my main job is being a full-time homemaker, I still enjoy working a few hours a day as a marketing consultant. Before leaving my office for the day I pull up our Living Without Walmart dream list to see if I can cross anything else off the punch list. Someday I hope to have every task is checked off. As I was making mint tea from our herb garden, scrambling eggs from our hens, and frying potatoes from the garden, I was so proud knowing that our breakfast didn’t come from a store, but right from our own backyard. At the same time, I was reviewing our grocery list and dreading the monthly trip into town. 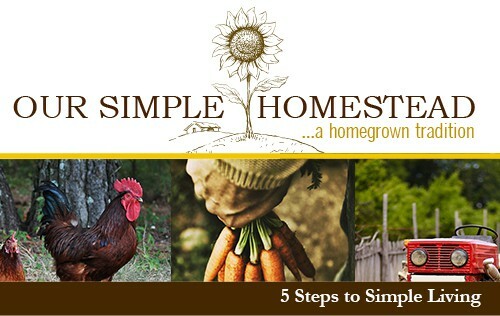 I was tired of spending so much of our hard-earned money and needed to push our homestead to be even more self-sufficient. 5:00 PM – Off to check on supper and the animals one more time before it gets dark. During your life often the things you treasure and hold dear are the relationships you have with your family. Those relationships need to be nurtured to stay strong through lives ups and downs. 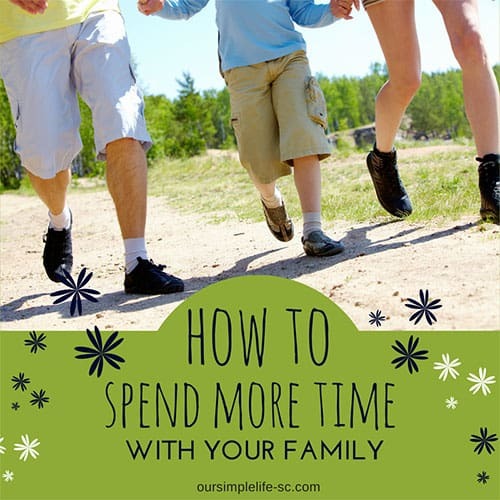 So it is important that you learn how to spend more time with your family right now. Like most days here on the homestead, my days are filled with projects, gardening, animals and a few hours of office work. Someone asked me once if I could change one thing about my life what would it be? I honestly couldn’t think of a thing. I love our life and even with its mild ups and downs, we are happy and content living a very simple life. As a non-Amish Christian, you may think there is no way you could live and model yourself after the Amish. I am here to show you that even in our very modern world we too can separate ourselves from the world just enough to keep us grounded to a simpler way of life. 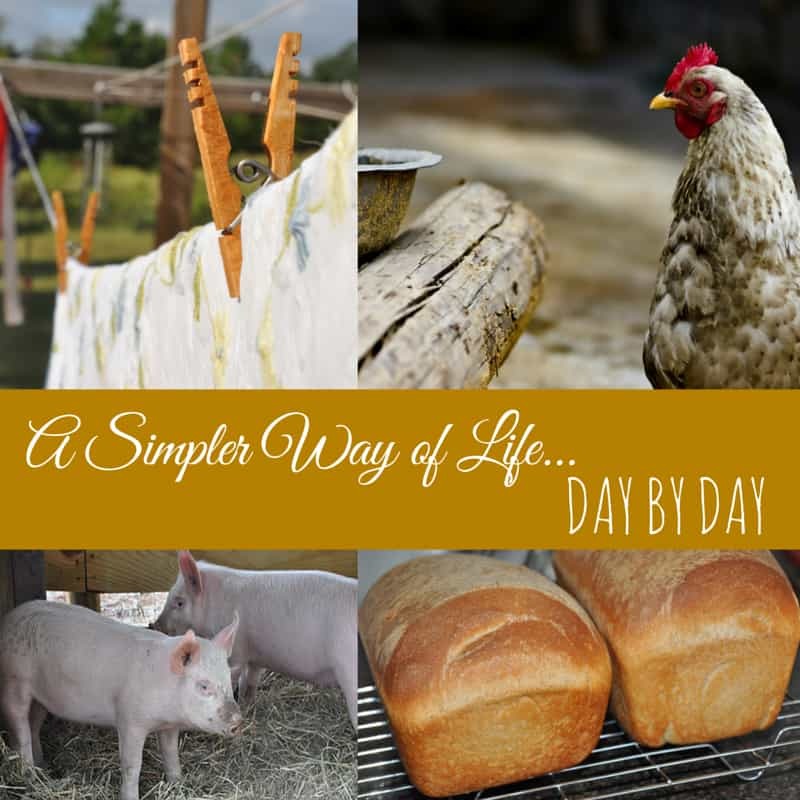 If you want some inspiration and want to learn to live a simpler life I encourage you to model your daily life and habits after the Amish. 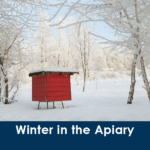 You may not fathom living without electric or even driving a horse and buggy, but we have found the simple principles they live by very appealing. 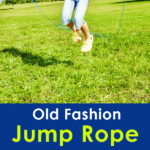 Old Fashion Jump Rope Songs – Memories from the past! Sounds like you have a wonderful, peaceful, yet fulfilling life! Truth be told, if I have to get up before 6 AM, I am a grump for the rest of the day. 6:30 is my ideal wake-up time 😉 I absolutely adore chicken and dumplings and this is a meal I cook often. I pray you have a wonderful year full of happiness and good health! Thanks Vickie…I hope your year is full of happiness as well! Wow, your day is so much more productive then mine. Stopping by From the Making Your Home Sing linky. I would love to say my days are always so productive…some are not, but that day was! Tracy, You wrote about such a desire of my heart!! Ever since I was a little girl I was always fascinated by the Amish. Living in New Jersey just a couple of hours away, we would visit there. It is still one of my favorite vacation spots! I love the peacefulness of the Amish lifestyle and the farmlands. 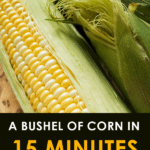 I have often said to myself that I would like to “live like the Amish even though I am not Amish”, and then I read the ending of your post, seeing you expressing the same sentiment and fulfilling that dream. Indeed, there are so many ways to live a simpler life even now in 2016. Jesus Himself modeled the simpler life, never rushing, telling us to learn from Him, because His ways are peaceful. Thank you so much for taking us into your day. I enjoyed reading about it so much! Karen I have the same desire in my heart! I grew up in Northwestern PA with Amish neighbors and to this day I have many Mennonite friends. They are a true inspiration for me and we have learned so much from them. There is a peace about them that I just can’t explain. Now don’t get me wrong…they have issues just like we do, but overall they have a true love and appreciation for the Lord and the simpler way of life. Thanks for visiting! Your day flows beautifully. A little time outdoors always puts me in a better mood. I love the shot of your clothesline! So glad you shared this on The Maple Hill Hop! Thanks Daisy! My clothes line brings me much joy. I just love smelling clean clothes that have been line dried! Thanks Jes…means a lot coming from you! Your life sounds perfect for you! I’m glad you shared these simple ways to make life better and make your family smile! Hanging laundry on a clothesline and making bread -two of my favorite chores. Thanks for sharing at Merry Monday, hope to see you again next week! 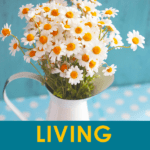 Lovely post – you provide inspiration for the hurried and frazzled masses. Finding peace in our days requires mindfulness and gratitude, and you obviously strive for both! Visiting today from Our Simple Homestead hop. 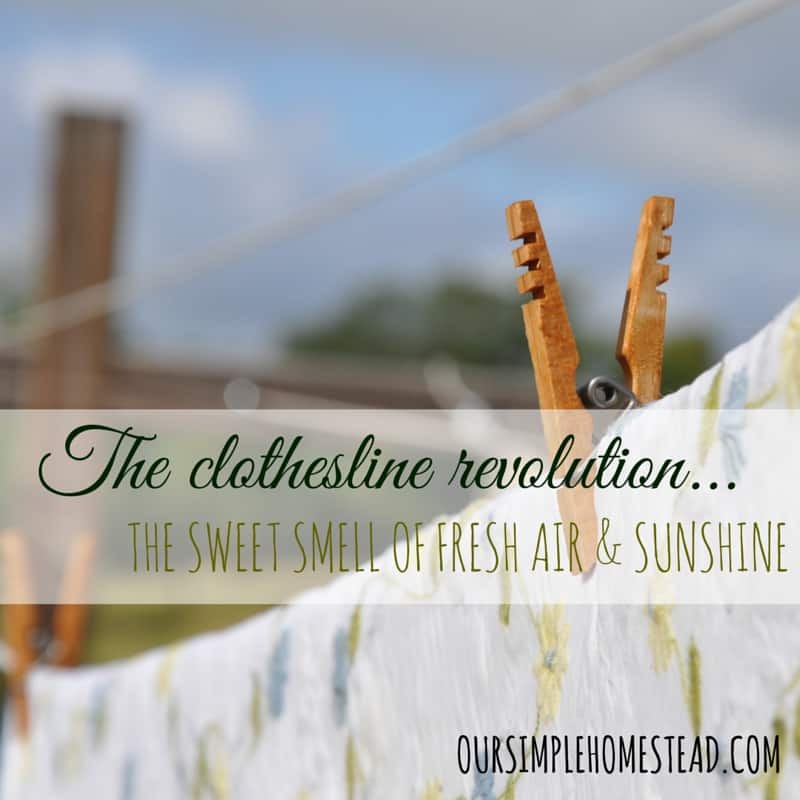 I really got into using the clothesline when my daughter was still in her cloth diapers – there was something so relaxing about getting outside and hanging them for those few minutes every couple of days. Thanks for joining us at #FridayFrivolity! I couldn’t agree more! I love my clothesline time!